Our hideaway on the tranquil Windward side of O`ahu is peaceful and quiet, ringed by the Pali mountain range and close to the kayaking and sailing paradise of Kaneohe Bay. We are also within easy reach of downtown Honolulu. Tripler Hospital and Honolulu airport are only 20 minutes away; Castle Hospital, Kaneohe Marine Corps Base: 10 minutes; 17 minutes to Kailua Beach; Less than 10 minutes from freeways into Honolulu, Aiea, Pearl City and other areas(H3, Likelike, Pali Hwy). Walk to Kaneohe movie theater, supermarket, pharmacy, malls, yacht club; home-style cooking and fine dining nearby. Plenty of space to store your kayak and sports gear. Doctors, medical residents, nurses at Queens, Tripler Hospital, Kaiser, Castle, etc., teachers, newly-weds, and folks from all branches of the armed forces have enjoyed our restful environment. Our two recently remodeled 1 BR apartments (Dolphin Unit and Starfish Unit) are located a few minutes walk from Kaneohe Bay. 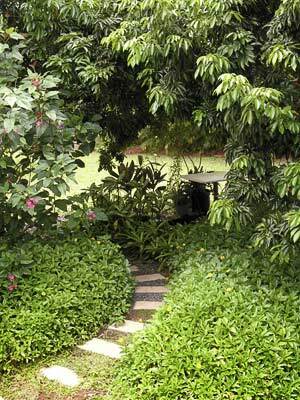 Tree-covered private entry path leading to Dolphin Unit. 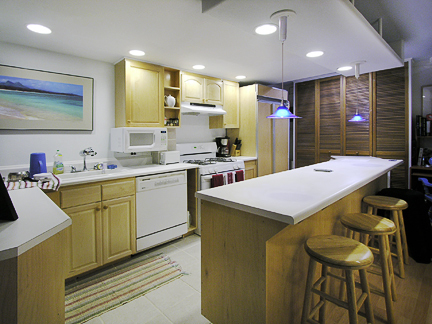 Starfish Unit: designer kitchen with 8 1/2 foot island/breakfast bar. Go for a sail or kayak on Kaneohe Bay. Our two designer 1-bedroom apartments are tastefully furnished, and feature an art collection including Kastner brothers' photography and Asian art. Main house occupied by busy professionals who love to sail, kayak, hike and bicycle. We're happy to share kama`aina tips on great places for those and other activities. We also have some raised bed garden areas for folks who like to grow organic vegetables. This is a peaceful neighborhood so we are definitely seeking someone quiet. Best for serious/studious professional.